(private collection) I find India culture fascinating. 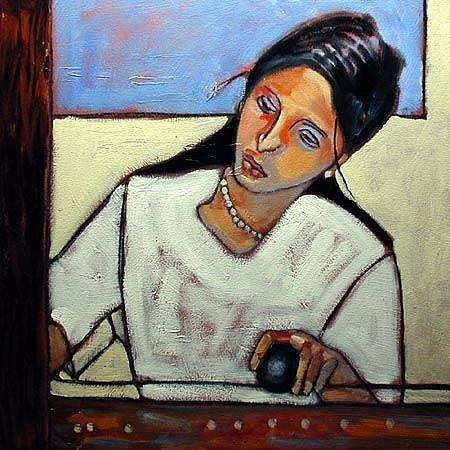 In this piece, we see a modern woman practicing playing the veena, an ancient India instrument. I think the India culture does an excellent job of integrating their past traditions into modern life. My husband is Greek and because of the strength of the local Greek community in Ann Arbor, MI near where we live, we are also able to continue many of the Greek traditions, including religious practices and ancient forms of dance. I think this is really important because it enriches your life immensely. Veena is the ancient instrument of India, as from the time of the Vedas the veena was played as an accompaniment for Vedic recitation. Veena is the generic term in Sanskrit to mean any instrument. The voice is called Sareera Veena and Gatra Veena. During the Vedic times, the veena was played by a pluctrum (vadana) during the sacrifices by the wives of the priests when they recited the Vedas. The veena was called Audumbari, as the instrument was made out of Audumbara wood. There was also another veena called Pichola during the Vedic times which was played by the wife of the yajamana or the performer of the sacrifice.